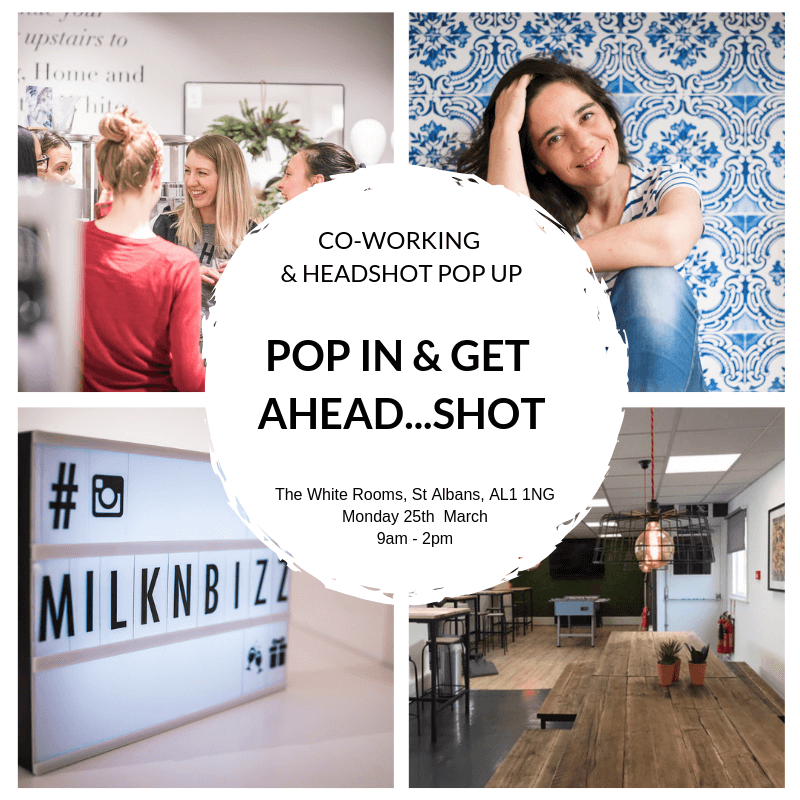 milknbizz is hosting a pop up Co-Working session on Monday 25th March at The White Rooms, St Albans where you can work alongside other mums in business who ‘GET IT’. We are also partnering up with local photographer Stephanie Belton who will be taking professional headshots at discounted prices on the day alongside co-working “action shots” for milknbizz. Having a decent professional head shot is a great investment for your business. You could be a camera shy introvert or a natural born poser, your audience and prospective clients are always interested to find out more about the person behind the business. People buy from people and it’s so useful to be able to put a face to a name, helping establish trust and loyalty as well as brand awareness. Whether it’s for the “About Us” page on your website, your LinkedIn profile or a PR opportunity, you will at some point be required to provide a good photo of yourself. A professional photographer will be able to capture you in your best light and produce images that fit your brand. Stephanie is an award winning photographer specialising in portraiture and events. Based in St Albans, she works with many local businesses, from personal branding with solo entrepreneurs to commercial advertising photography with larger organisations such as Hatfield House and St Albans Council. For more information about her work, please visit https://www.stephaniebelton.com. Stephanie has kindly offered a special discount on the day for anyone who would like to get professional headshots. The sessions last 10 minutes or so and she will capture a series of images for you to choose from. There are no structured time slots, it will just be on a first come first served basis. The event will be very informal and relaxed and will also be a great opportunity for you to network and meet other like minded mums in business. If you are interested in joining milknbizz and sign up on the day you will benefit from the discounted members rate as well as all the other benefits from becoming a member.